Playing at an online casino is not just about winning large jackpots but also about having fun in a secure and great looking gaming environment; this is what Jackpot Grand casino is all about. It is a new addition to the great world of internet gambling, being launched in early 2013, and it hasn’t wasted any time to impress online players. It has a license from Curacao and it is available for players from around the world, including the United States, with popular deposit options to make it easy for everyone. It is easy to see the effort and dedication that went into making Jackpot Grand from the site which is one of the best looking online casinos on the internet. After that, there are the many games available which can be played right from the browser. 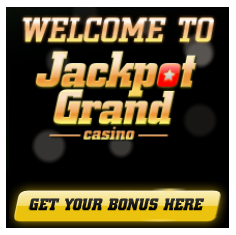 New players need to sign up with Jackpot Grand before being able to access the games and this can be done on the website by clicking on “Instant Play” and then “Sign Up” or by downloading and installing the software which will start with a small window that can be used to register an account. Either way, the boxes are the same and there is some personal information required and preferred account details. Since this is a new online casino, it is very possible that special bonuses will be added so subscribing to the email newsletter is recommended; this will allow the site to send emails with the latest promotions. The best way to always have access to the online casino games is to download Jackpot Grand. The software is free and pretty small so it doesn’t take more than a couple of minutes to download and install the application here. Some additional downloads will be made afterwards in order to make starting as easy as possible. The software keeps the same theme as the site with the games carefully organized in six groups. Jackpot Grand came online with some very impressive promotions that can appeal to all types of gamblers. To make things perfect, every new player has the option to choose what welcome bonus he prefers and claim the promotion that suits his style the most. There are three welcome bonuses to choose from. The first welcome bonus is also known as the Welcome Package and it is a general bonus of 200% on the first deposit, up to $2,000, that can be used on a variety of casino games. Be sure to check out the list on the site and also notice the requirements for withdrawing the winnings. The second welcome bonus is designed for slots and enthusiasts of the game will be able to claim 400% up to $4,000 when they first fund their accounts. There are certainly enough games to spend the free money on so playing at Jackpot Grand can be very fun and profitable. The third welcome bonus to choose from is for table games such as blackjack and Video Poker. Users that claim this bonus will double their amount up to $1,000. The promotions do not end once players choose their favorite welcome bonus and play through it; there are weekly bonuses available all the time which can be claimed with ease. In order to claim a particular bonus, the user must introduce a code which can be found on the site, under the Promotions tab. All the games are provided by Realtime Gaming (RTG), one of the biggest gambling software developers on the internet. With over 180 options to choose from, players always have something new to try out and more titles will be added to the list. Since there are bonuses for different categories of games, it is safe to say that Jackpot Grand has gaming options for everyone but slots are the most diverse. Of course, there are some large jackpots that can be claimed with every spin but this was expected given the name of the online casino. Since it is an online casino designed for players from every corner of the world, the deposit options available are very well known and easy to use. Most players tend to use debit and credit cards from Visa and MasterCard, but payments done with e-wallets are becoming more and more frequent. Jackpot Grand accepts Neteller, MoneyBookers, Ukash, Unionpay and EcoCard with the minimum deposit amount for all options being $21. The customer support staff at Jackpot Grand Casino is very polite and can be contacted with ease thanks to the 24/7 live chat feature. It is also possible to use email and also a US toll free phone number. All things considered, Jackpot Grand is a very impressive online casino that is expected to become very popular over the next couple of months. The promotions are big enough to rival some of the oldest sites in the business and the new games look incredible.